Melissa's presentation is sponsored by Bagua Center, a spiritual haven for Miami’s community, a renewing getaway as well as a gift shop for locals and travelers from all parts of the world. Energy Medicine is a complementary treatment that recognizes energy as a vital, living, moving force that creates health and happiness, that includes vibrational energy (sound) and electromagnetic energy (light or life force). It activates your body's natural healing energies into a good flow, harmony, and balance. Reiki Healing amongst other healing modalities will be explored and introduced. 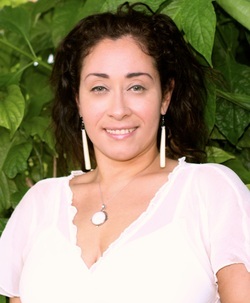 Melissa ALUNA Solano, founder of iloveology, is a dynamic Life Strategist, Transpersonal Therapist, Intuitive Consultant, Usui Reiki Master Teacher, and Transformational Breathwork Facilitator. Her blend of extensive experience, doctoral studies in psychology, and powerful energy healing modalities allow her to help you to tap into your unlimited potential. She guides others to connect to their soul, mind, and body through integrative techniques to restore balance and create well-BEING. She is passionate on inspiring individuals to experience a deeper understanding of themselves and their purpose. Melissa continues to facilitate empowerment groups and workshops that center on promoting clarity, relaxation, and vibrational cleansing/healing at Bagua Center; as well as private consultations and sessions.